Zanzibar lies 40km off the coast of East Africa in the Indian Ocean, about 6 degrees south of the Equator. Zanzibar has a total of 1500 square kilometers, which includes many surrounding islands. It is 85km long and 30km wide. Zanzibar is generally flat with the highest point being about 120m above sea level. The Islands of Zanzibar are surrounded by coasts of rocky inlets or sandy beaches, with lagoons and mangrove swamps, and coral reefs beyond the shoreline. The climate is characterised by wet and dry seasons. The rains fall from mid-March to the end of May, and there is a short rainy season in November. The dry seasons are from December to February and June to October. Humidity is generally quite high, although this can be relieved by sea breezes. The average daytime temperatures are around 26 degrees form June to October, and around 28 degrees from December to February. are grown for local consumption. There are no large wild animals in Zanzibar. Monkeys and small antelopes inhabit forested areas. Civets and various species of mongoose are found all over the islands. Bird life is varied and interesting with over 100 species recorded. The monsoon winds that blow across the Indian Ocean allowed contact between Persia, Arabia, India and the coast of East Africa for over 2000 years. The first European arrivals were Portuguese 'navigators' looking for a trade route with India. They reached Zanzibar at the end of the 15th Century and established a trading station here and other points on the East African coast. At the end of the 17th century Omani Arabs ousted the Portuguese. During this period, Zanzibar became a major slaving centre. In 1840, the Omani Sultan Said moved his court from Muscat to Zanzibar, and the Island became an Arab state and an important centre of trade and politics in the region. Many European explorers, including Livingston and Stanley, began their expeditions into the interior of Africa from Zanzibar during the second half of the 19thcentury. Zanzibar was a British protectorate from 1890 until 1963, when the state gained independence. In 1964, the sultan and government were overthrown in a revolution. In the same year, Zanzibar and the newly independent country of Tanganyika combined to form the United Republic of Tanzania. The population is estimated around 900 000. Zanzibar's largest settlement is Zanzibar Town with about 150 000 inhabitants. Other towns on Zanzibar Island include Chaani, Bambi, Mahonda and Makunduchi, but these are small. Outside these towns, most people live in small villages and are engaged in farming or fishing. The Language of Zanzibar is Swahili. Visitors with a basic grasp of this language will be understood anywhere, although there are many forms and dialects found in different areas. Arabic is also spoken. English is widely used in towns and tourist areas. Islam is the dominant religion, and practiced by most in Zanzibar. All towns and villages have mosques. In Zanzibar Town there are also churches and temples for the small populations of Christians and Hindus. Zanzibar is a separate state within the United Republic of Tanzania, governed by a revolutionary Council and House of Representatives, whose members are elected or appointed. The president of Zanzibar is also the vice-president of Tanzania. For the people of Zanzibar, fishing and farming are the main economic activities. From the beginning of the 19th Century to the mid 1970s Zanzibar exported a large proportion of the worlds cloves, and the islands' economy was based largely on this commodity. Some diversification has occurred since then, but cloves are still a major export, along with coconut product and other spices. In recent years, seaweed has also become an important export commodity. The potential for tourism to be a major earner of foreign currency has been recognized and is being developed. The number of tourist visiting Zanzibar is still relatively small but increasing every year. 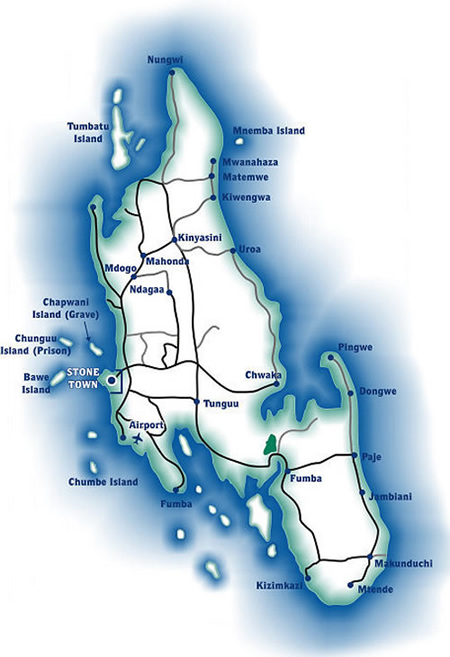 Zanzibar's unit of currency is the Tanzanian Shilling (TSh). Visitors to Zanzibar must pay for some items, such as air fights, ship tickets and hotels, in foreign currency, usually US dollars. 1US dollar = 890 TSh approx. 1 ZAR Rand = 78 TSh approx. Most passport holders require a visa for Tanzania/Zanzibar. This is obtainable from the Tanzanian High Commission in Pretoria. The visa is valid for 3 months and cost is $50/visa at present.